This is a step by step illustration of our early church Pioneers or “old-timers” dying off and the effects of educated scholars inserting their academic influence in changing the direction of our church to what has become now-from non-trinitarian to a decidedly a trinitarian denomination. While there are quite a few more events that have taken place, to keep the focus on the subject of change, we have elected to stay with the key events. This list was put together by As It Reads along with David Allen of Truthseeker Ministries. 1860 – The remnant (Sabbath-keeping Advent believers) is given the name Seventh-day Adventists which carried Heaven's approval. 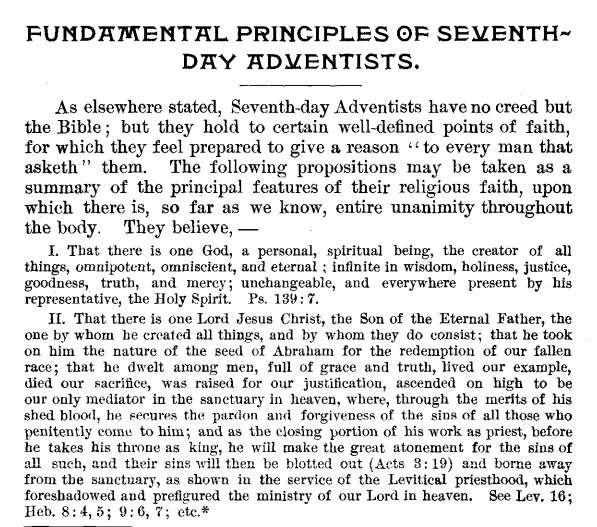 1872 – The "Declaration of Fundamental Principles Taught and Practiced by Seventh-day Adventists" consisting of 25 propositions largely written by James White is published as a pamphlet at Battle Creek, Michigan (To view or download the original pamphlet click HERE). This lays down a clear non-Trinitarian foundation and is not replaced or changed in any way until 1931. These propositions are based on 1 Cor. 8:6 and contain neither the term Godhead nor Trinity. First year that the Fundamental Principles were actually published in the Yearbook was 1889. Prior to 1981, the years of publish are 1905, 1909, 1913, 1914. Then it goes dark but published again until it changes in 1931. Then 1942, 1955, 1965-66, 1973-74, 1975, 1980, 1981. 1872 – Death of Elder Joseph Bates. 1877 - The Biblical Institute, where Uriah Smith and James White outline the Principal Doctrines of Seventh-day Adventists, is held in Oakland, California. Covering everything from the Sanctuary to Prophecy, the nature of Sin to the nature of Christ, this Institute confirms and strengthens the teachings of Adventism, as outlined in the Fundamentals of 1872. 1881 – Death of Elder James White. 1883 – Death of Elder J.B. Frisbie and Elder John Nevins Andrews. 1883 - At this General Conference Session, it is decided against publishing a Church Manual, as it is deemed undesirable to take any steps towards a discipline, creed or form of formalism (RH, Nov. 27). 1889 – The Fundamental Principles are expanded to 28 sections and published in the 1889 Yearbook, leaving the first two on the doctrine of God unchanged. It remains unchanged during its reprinting from 1905-1914 in the SDA Yearbook. Click HERE to view or download the original 1889 SDA Yearbook (Fundamental Principles are found on pages 147 to 151). 1889 – Death of Elder Joseph Harvey Waggoner (Ellet Joseph Waggoner’s father). 1890 – Leadership attempts to remove the name Seventh-day Adventist from the American Sentinel (Religious Liberty journal of the SDA Church) to make the magazine popular with other denominations, but this step is averted because a living prophet is present. Ellen White states, “This policy is the first step in a succession of wrong steps” (Counsels to Writer and Editors, p. 96) the leading brethren are taking down the road to ecumenical concessions. 1891 - The General Conference sends Ellen White far away to Australia, contrary to the light given her (This Day With God, p. 61). E.J. Waggoner is sent to England as editor of The Present Truth for 10 years to separate him from A.T. Jones and E.G. White (Letter from W.C. White to A.G. Daniells, May 30, 1902). 1892 – Death of Elder Roswell F. Cottrell. 1892 - Bible Students' Library series - lessons for the public. # 90 "The Bible Doctrine of the Trinity." Reprint of article in New York Independent on November 14, 1889. Author - Samuel Spear (non-SDA). Promotes "one God subsisting and acting in three hypostases/persons," but also in “eternal divine subordination of the Son to the Father." The tract used terms not generally used by Adventists, but it is generally non-Trinitarian in content. 1894 - Ellen White warns, "It is a grave mistake on the part of those who are children of God to seek to bridge the gulf that separate them from the children of darkness by yielding principle, by compromising the truth." (BEcho, April 9, 1894, par. 6) “It is a backsliding church that lessens the distance between itself and the papacy.” (ST Feb 19, 1894) These counsels would later be disregarded by the leadership as we shall see. 1894 - Herbert Camden Lacey attends Sunday-keeping/Trinitarian meeting as a Battle Creek College delegate to Student Volunteer Movement for Foreign Missions in Michigan. Lacey re-accepts the Trinity doctrine. 1896 - H. Camden Lacey lectures on Trinity in Cooranbong, Australia. Sister Marian Davis, literary assistant to Ellen White, takes copious notes. Arthur G. Daniells does not oppose the lectures. 1897 – John Harvey Kellogg presents his first concepts leading to Pantheism at a series of studies he gives at the General Conference session. 1898 – The Review and Herald prints an article from “The King's Messenger” which is Trinitarian in teaching – “The God-Man” (1898). 1898 – R.A. Underwood’s view of the Holy Spirit changes from an influence to a person, thus becoming a Trinitarian. 1900 – The Review and Herald again prints two more articles from “The King's Messenger” both of which are Trinitarian in teaching –“The Third Person” (January 1900), and “ Blended Personalities” (April 1900). 1901 – The American Standard Version of the Bible is first published. This move towards a common Bible between Catholics and Protestants will influence Adventism in small steps away from truth. 1902 – J.H. Kellogg prepares to publish his work, The Living Temple. He is told not to include his new theories, but ignores the counsel. He tries to gain approval at the Autumn Council for his book to be published but a letter from Ellen White to Daniells counsels him to have nothing to do with the book. Kellogg takes his manuscript to the Review and Herald publishing house as outside work, and they agree to print it. As the result, the Battle Creek Sanitarium (February 18) headed by Kellogg and the Review and Herald printing office (December 30) burn to the ground, and with it the galley proofs of Kellogg’s book Living Temple. But he takes the manuscript to a non-Adventist printer. 23 fires would happen between 1901 and 1923. Judgment has ruled from the heavens above. 1903 - Crisis begins with Living Temple and the Alpha heresy. 1903 - Autumn Council, the understanding of the character and personality of God comes under threat. 1903 – New Constitution is proposed to provide for the election of a G.C president who will be given a mandate from the Church. This will give the president and leading officers authority to enact what they think the people need. Daniells is made president for the next 20 years. New Constitution provides for the Exec Committee of 25 members to have full administrative power between sessions for any five members as a quorum to take steps that will involve the whole committee. Ellen White writes, “These principles are so foreign to God’s principles that God cannot bless those who vote upon them.” (GCB 1903, p.152) E.J. Waggoner also objects: “It is fundamentally and diametrically opposed to the principles of organization as set forth in the Bible.” (GCB 1903) Percy Magan says, “They are the same principles and introduced in precisely the same way as they were hundreds of years ago when the Papacy was made.” (GCB Day 3, No 10, p. 150) A.T. Jones states, “This proposed constitution is subversive of the principles of organization given to us at the G.C of 1897 and that of 1901.” (GCB 1903, p. 152,153) This G.C session has rejected the 1897 and 1901 recommendations. 1903 – Uriah Smith dies. For more on Kellogg and the early Adventism, check out this article by Terry Hill, "The early 1900’s crisis - Kellogg and the Holy Spirit"
1905 – The 28 Fundamental Principles of 1889 “Synopsis of our Faith” is inserted again in the church Yearbook, and continues until 1914. 1905 – Daniel Bourdeau dies. 1913 - F. M. Wilcox publishes a supposed “Trinitarian tract” and a quote from Ellen White (taken from Desire of Ages) next to it from 1898 to paint a false picture of belief in the Review and Herald, Vol 6, Oct. 9, 1913, p 21. Wilcox rolls out the divine Trinity which includes the Holy Spirit as the third person of the Godhead. This sets the stage for making the Godhead (used exclusively by Ellen White) equivalent with Wilcox's "divine Trinity." This is apparently a response to counter the claim published by James Gray of the Moody Bible Institute that Adventists deny the Trinity (James Gray, Bible Problems Explained, 1913). 1915 – Ellen G. White dies. When Ellen White died in July 1915, three funerals and a graveside service memorialized her life of ministry. An estimated 5,400 people attended these services.The first funeral was held July 18 on the lawn at her home in California, known as Elmshaven. A second was held the next day in Oakland, California. The third and largest service was held on Sabbath, July 24, in Battle Creek, Michigan, where Ellen White had lived for many years and where she was to be buried beside her husband, James. 1915 – The “Synopsis of Our Faith” which is the Fundamental Principles mostly written by James White in 1872 and inserted in the 1889 Yearbook and again in the 1905-1914 Yearbooks are now removed from the 1915 SDA Yearbook by a mere General Conference statistician, Edson Rogers. He obviously did it as soon as the living prophet has died. Thus the Fundamental Principles held in great unanimity by the pioneers are put out of the way. 1916 – Elder E.J. Waggoner and Dr. David Paulson die. 1918 – Death of Elder George I. Butler, Elder James H. Morrison and Elder W. H. Littlejohn. 1919 - Bible and Teachers Conference takes place in secrecy with the discussion becoming heated at times as some in leadership positions test the waters to see if the doctrine of the Trinity can be brought in. There is enough resistance to table the conversation for another time. The recorded minutes for this five week long event (July 1 to August 1) disappears for 55 years until 1974. Click HERE for the full original Report of the 1919 Bible Conference (7/1 to August 1, 1919). Click HERE for the notes on the Bible Conference provided by Dr. Gary Hullquist. 1922 – Elder Stephen N. Haskell, author of many best selling books and Adventist Pioneer, dies. 1923 – Elder Alonzo Trevor Jones and Elder O.A. Johnson die. 1924 – John Norton Loughborough, the last of the first generation core of Pioneers, dies. 1926 – LeRoy Froom (who is the first associate secretary and then made secretary of the GC Ministerial Association until 1950) is asked to present studies on the Holy Spirit at the Milwaukee General Conference Session. In preparation for his studies, Froom went to books written by authors outside of our faith (he went to Babylon for his material) to reference their writings as he could not find in our own denomination writings that would line up with his agenda. Gradually the meaning of the word “divine” changed, until it meant not fully divine. We do not know how it changed, but Trinitarians were using the term “deity”, instead of “divine”. (Once divine and deity meant the same.) When Froom uses the words “all the fullness of the Godhead”, he is making two statements -- an Arian or Semi-Arian belief is not true Christianity, and the Trinity has a Saviour with full deity. 1926 – G.C Working Policy (075) is adopted. SDA Church becomes a part of evangelical churches. The policy states, “We recognize every agency that lifts up Christ before men as a part of the divine plan for the evangelization of the world, and we hold in high esteem the Christian men and women in other communions who are engaged in winning souls to Christ.” (“Relationship To Other Societies,” GC Exco, 1926) This would include the Jesuit Order. Ellen White has warned, “Shall this power, whose record for a thousand years is written in the blood of the saints, be now acknowledged as a part of the church of Christ?” (Great Controversy, 1888, p. 571.1) This is the first “wrong step” toward ecumenical concessions taken by the G.C. 1928 – Death of Elder James Edson White, son of James and Ellen White. 1928 – LeRoy Froom is invited to present a series of studies on the Holy Spirit at the North American Union Ministerial Institute. After the Institute meetings he says, “You cannot imagine how I was pummeled by some of the old timers because I pressed on the personality of the Holy Spirit as the third person of the Godhead.” (Letter from LeRoy Froom to Dr Otto H. Christenson, Oct 27, 1960) Ellen White has also used the term “third person of the Godhead” but with very different connotations. 1928 – LeRoy Froom, founder of Ministry Magazine, begins promoting the American Revised Standard Version of the Bible and demotes the King James Bible to not accurate and old-fashioned status. He tours the U.S. promoting the Sunday Trinity to Adventist ministers and writes the book The Coming of the Comforter. 1928 – The Coming of the Comforter, a pro-Trinity book by LeRoy Froom, is published upon urgent request of hundreds of ministers who heard him speak. In the book he emphasizes strongly the personality of the Holy Spirit as a separate being from the Father and Son. The book contains many quotations from the Spirit of Prophecy, but the interpretation is totally different than the teaching of the pioneers. More on Froom HERE. 1928 – W. W. Prescott who was educated by the secular Dartmouth College, writes eleven articles in the Signs of the Times documenting the Sunday scholars' proof of the inferiority of the King James Bible. The Bible of the Pioneers is under assault and being replaced by modern corrupt versions. 1928 – General Conference leadership adopts the American Revised Version Bible, which is inspired by the Jesuits of Rome, above the Authorized KJV Bible of the pioneers. This version comes from scholars that rely on two manuscripts, the Vaticanus and the Sinaiticus (Constantine’s state Bibles.) This is the second “wrong step” toward ecumenism. This step is now possible with the passing of the last pioneer. 1929 – Healing of the deadly wound of the Papacy. The Lateran Treaty is signed between Italy and the Vatican, settling the "Roman Question." Italy now recognizes the Vatican City State as an independent state, and agrees to give the Church financial compensation for the loss of the Papal States. 1929 – A.T. Robinson writes an article “One God and One Mediator” for the Review and Herald, quoting 1 Cor. 15:28, giving the impression that the one God is the Father only. 1930 – Our Authorized Bible Vindicated by B.G. Wilkinson is published, documenting the origins and history of the King James Bible. The General Conference tries to discontinue the book and Wilkinson writes a second book in defense of his position, Answers to Objections to our Authorized Bible Vindicated. 1931 – Church leaders in Africa request a "statement" that will “assist in a better understanding of our work.” (27 Fundamentals Introduction) In answer to the request, a suitable Statement of Faith is placed in the 1931 Yearbook. Points that are entirely removed from the 1872/1874/1889 Fundamental Principles include: Prophecy as a part of God’s revelation to man, World history fulfills Bible prophecy, and Papacy (man of sin) changed the Sabbath. The pioneer view on the post-fall human nature of Christ is changed to a pre-fall human nature, Christ’s work of final atonement in the most holy place since 1844 is omitted and now replaced with atonement being completed on the cross and Christ now lives to make intercession for us, and the cleansing of the sanctuary involving the work of blotting out sins is now replaced with only a work of judgment. Now the SDA Church has a new statement on the Trinity, a new Christ with an unfallen human nature instead of a fallen (but not corrupted) human nature, and a new final atonement that was completed on the cross rather than finished in the most holy place in heaven. These doctrinal changes place the SDA Church in harmony with the Sunday-keeping churches of Babylon, and make it possible for ecumenical ties with other denominations. To substantiate these new apostate doctrines, a new Bible, the American Revised Version (now approved by the Papacy), is embraced. By 1931, periodicals, tracts and books have been published “on the ‘Three Persons’ of the Godhead, the eternal pre-existence and complete Deity of Christ, and the personality of the Holy Spirit” by LeRoy Froom (Movement of Destiny, p. 418). 1935 – Death of Arthur Grosvenor Daniells, one of the key men in apostasy. The non-trinitarian beliefs contained in the 1936 Sabbath School lesson. 1936 – The General Conference Sabbath School Committee publishes a series of Sabbath School lesson studies (starting with the 4th quarter 1936 to the 2nd quarter 1938) for the church which is intended to show the world what Seventh-day Adventists officially believe, and purportedly to show that the church still upholds the Adventist Pioneer position on the nature of God and Christ. Six men including F.M Wilcox and M.E Kern were voted by the G.C Committee in late 1935 to sit with the Sabbath School Department Lessons Committee when they compile the studies on essential Bible doctrines. The studies apply Trinitarian language to non-Trinitarian belief, in effect subtly reinterpreting it in Trinitarian terms. In the third week of the 4th quarter 1936 lesson under the title "The Godhead", the word Trinity is used twice, once as a heading and once as a sub-heading. Under the "Trinity" heading, they state that "three powers wrought in the work of creation," and that "the name God is used of the Father, of the Son, and of the Spirit--a kind of heavenly family name. These three constitute the Godhead." Then under the heading "Unity of the Godhead", they state, "The Father is in the Son, and the Son is in the Father. The Spirit is 'the Spirit of God' and 'the Spirit of Christ.' Hence all three dwell together, and the three are one." (Lesson 3, p.10) The only other time that the word Trinity is mentioned again is in Lesson 10, which states, "Since the divine Trinity is composed of three persons, there is established a personal relationship between the Godhead and the one baptized." (Dec. 5, p. 31) Nothing else is said about the word Trinity, and the phrase "Trinity doctrine" is not used, but intimations of it are being subtly conveyed. At this point, the begotten belief is still the official belief. Time and death is needed to change it to an unbegotten belief to support the false claim that Christ could not be begotten and yet be fully God in His pre-existence. Ellen White believed that Christ was truly begotten and still truly God, for she said in 1905, “The Lord Jesus Christ, the only begotten Son of the Father, is truly God in infinity, but not in personality.” (Manuscript 116, Dec. 19, 1905) The 4th quarter lesson rightly concludes regarding the pre-existence of Christ that “He was therefore no part of creation but was ‘begotten of the Father’ in the days of eternity, and was very God Himself.” (Lesson 4, p. 13) In the section regarding the Deity of Christ, the lesson rightly recognizes that Christ as the begotten Son has inherited God’s name and therefore can rightly be called God. So it seems that as late as 1936, Ellen White's writings have actually not changed the beliefs of the church about the pre-existence of Christ as the truly divine begotten Son of God, contrary to later claims that they have. Also at this point, the Holy Spirit is still not officially regarded as a divine person exactly like God and Christ are persons. The lesson states, “Hence the Father sends the Spirit in the name of the Son, that is, as the Son’s representative. The Spirit ‘proceedeth from the Father,’ to do His work in the earth… Hence the Father sends the Spirit, and the Son sends the Spirit. The Son speaks what the Father gives Him to speak, and the Spirit speaks what the Son gives Him to speak. The Spirit is both the Spirit of God and the Spirit of Christ…” (Lesson 3, p. 11) Click HERE to view the original Sabbath School lesson of 1936. 1937 – Death of Willie C. White, son of James and Ellen White. 1939 – W.W. Prescott preaches a sermon at the Takoma Park Church, where he says that Scripture “clearly implied the doctrine of the Trinity… There are three persons in the Godhead, but they are so mysteriously and indissolubly related to each other, that the presence of one is equivalent to the presence of the other.” Elder Judson S. Washburn protests what he hears and sees happening in the church by writing a letter to the G.C president J.L. McElhany against the Trinity doctrine. It was circulated by a conference president to 32 ministers. 1941 – General Conference Committee votes that the Statement of Beliefs be made available in leaflet form and officially released as our accepted Statement of Faith. The committee also approves a uniform ‘Baptismal Covenant’ or ‘Vow’ in certificate form, based on the now generally accepted Fundamental Beliefs declaration of 1931. 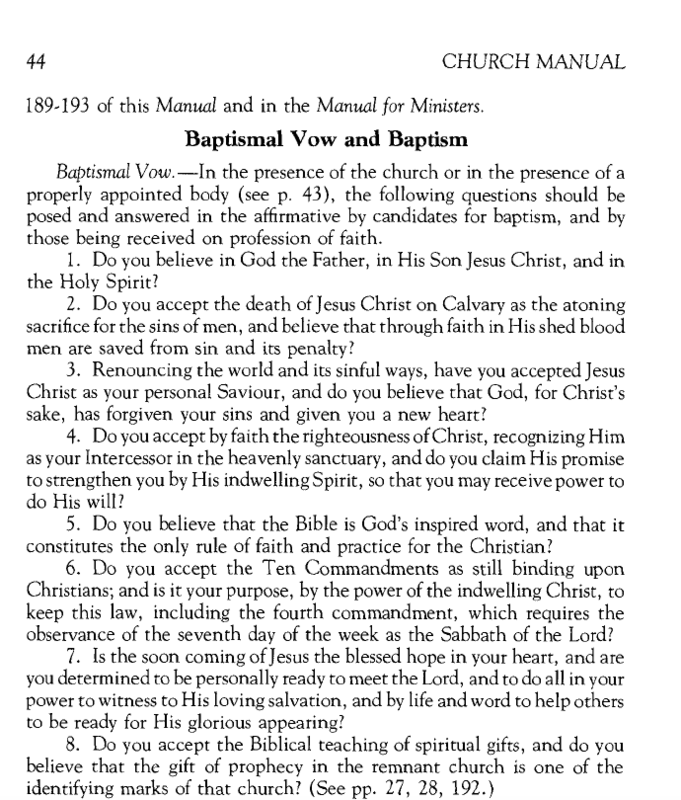 (G.C Session in San Francisco) The Trinitarian-worded baptismal vow is formulated by 13 men led by Prescott. They call the Father the first person, Jesus the second person, and the Holy Spirit the third person. The word Trinity is not used. 1941-44 – Hymnal “Christ in Song” and “Hymns and Tunes” song book copies are ordered back to the conferences for burning so that a new Church Hymnal with Trinitarian influence can replace them. This is under the guise of Roy Allan Anderson. 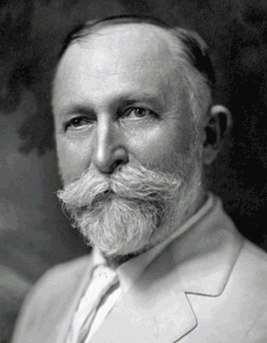 1943 – John Harvey Kellogg dies, after seducing many to his heresy. 1944 – Removal by committee of all 18 non-Trinitarian statements from Uriah Smith’s book Thoughts on Daniel and the Revelation in an attempt to cover up history. They eliminate every portion that said Christ was begotten of the Father. W.W. Prescott and others change the meaning of the “daily sacrifice” in the 2300 days message. Changes are also made to Spirit of Prophecy books, such as lower case changed to capital letters for Third Person. 1944 – Truth Triumphant by Benjamin G. Wilkinson is published, an exhaustive study of the history of God’s Church in the Wilderness. It contains strong statements against the Trinity doctrine. LeRoy Froom is angry, and orders the destruction of the original offset press plates so the book cannot be reprinted. 1944 – Death of William Warren Prescott, one of the key men in apostasy. 1945 – LeRoy Froom publishes a compilation of Ellen White quotes in Ministry Magazine to give credence to the “eternity of Christ”. Her understanding in this usage was far different than his. 1946 – Leadership again calls for a committee of four to make a statement of official beliefs. However, it is again penned individually by F. M. Wilcox through a statement of beliefs on the Trinity, originally written in 1931 by him and unofficially put in the Yearbook. 1946 - The compilation of Evangelism with careful, calculated use of certain Ellen White statements, many not even complete sentences, to paint a picture that she was supposedly Trinitarian, is done by LeRoy Froom, Roy Allan Anderson and Miss Louise C. Kleuser under the encouragement of Elder Branson (1966 Froom Letters). With the intent to deceive, Froom places these quotes from Ellen White in his book Evangelism under the heading "Misrepresentations of the Godhead" where she had said “third person”, “three great powers” and “Heavenly trio” etc. When reading the statements under such a heading, a subtle message is given. But all of these in fact refer to the Spirit of Christ and not another being. This is how Froom eventually managed to lead the entire Adventist Church astray because people do not take the time to research what else Ellen White wrote on these topics. They just take the one-liners like they are hypnotized. Froom’s book has persuaded many non-Trinitarians in the Columbian Union to “lay down their arms” and become Trinitarians. 1946 – The General Conference Session votes that all further revisions of the Church Manual must be approved in advance by the G.C in world session. 1946 – The General Conference, after being conditioned for 27 years (and a new generation of members coming into the church during those 27 years that knew nothing but the Trinity), votes to retain the 1931 Baptismal Vow officially. They then vote that “changes to the baptismal vow could only be made by the General Conference delegates in official session.” (Movement of Destiny, p. 422) The Trinity is now protected by the necessity of an entire church vote in session. The entire ministry and the world membership now believes the Trinity is true. 1947 – Charles S. Longacre writes paper #17 “The Deity of Christ,” clarifying the SDA church’s original stand on the Godhead – a non-Trinitarian article, submitting it to the Bible Research Fellowship for discussion. This would be the last of any major resistance left in the church for decades to come. 1948 – World Council of Churches is formally instituted in Amsterdam. 1949 – Bible Readings for the Home Circle is revised by D.E. Rebok in an attempt to remove any non-Trinitarian, Arian or Semi-Arian statements. Roy Allan Anderson had his influence in this as well. 1950 – Death of Herbert Camden Lacey, one of the key men in apostasy. 1950 – Elders R.J. Wieland and D.K. Short write a thesis for the GC entitled “1888 Re-examined”. This is eventually rejected with ongoing discussions up until 1961. This is a form of correction for the church through self-examination and getting back to truth. 1955 – Death of Elder Judson S. Washburn, one of the last of the connecting links to truth. 1955-56 – Evangelical Conferences take place between the General Conference (represented by Froom, Anderson, Read, and Unruh) and Walter Martin and Donald Barnhouse, editor of Eternity magazine. Are Adventists a cult? That was the question of the Evangelicals. The Trinity doctrine is one of the first issues discussed. Concessions are made on the Atonement and the humanity of Christ. Christ’s nature was changed to that of Adam’s nature before the Fall. The teaching of the atonement was changed to “completed at the cross”, instead of “commencing at the cross”. These changes were required by the protestant denominations for the SDA church to be classified as an evangelical Christian church instead of a cult or sect. We submit to the daughters of the Harlot in fear of being labeled a cult, and reject the Spirit of Prophecy writings because they do not reflect Adventist theology. But we were previously labeled a cult for years because our beliefs stood out from the rest of Protestantism. Ellen White warned in 1894 not to bridge the gulf that separates the children of God from the children of darkness. But this is not heeded. 1957 – Questions on Doctrine is published following those meetings – a pro-Trinity book written by LeRoy Edwin Froom, W.E. Read, R.A. Anderson and T.E. Unruh. This is to match the SDA Church with the Protestant and Evangelical world, to be accepted so we would not be labeled a “cult”. 1957 – SDA Church joins the CWC – Christian World Communions. 1958 – Death of Charles S. Longacre, a champion of religious liberty, an author who stood for the original Pioneer views within Adventism. 1962 – The Second Vatican Council begins to be held, concluding in 1965. The Roman Church repositions itself in relation to the modern world. Major changes occur in the Catholic Church, but the intention remains the same. The final stage is set for the Jesuit Order’s Counter Reformation to take over all the Protestant churches. 1962 – The World Council of Churches incorporates the Trinity doctrine in its prerequisite for membership, and becomes the foremost Ecumenical organization. 1962 – The 1962 Yearbook reprints the statement of faith in substantially the same form in which it first appeared in 1931. 1965 – Bernard Seton urges the General Conference to revise our Fundamental Beliefs. Several of our leaders had just traveled to Geneva Switzerland to enter into negotiations for closer contacts with the World Council of Churches headquarters. 1965 – Bert Beverly Beach becomes the SDA ecumenical liaison with other denominations. 1968 – Death of Elder Benjamin G. Wilkinson, Ph.D, after 76 years of active church service. This pioneer of Adventism spoke out against the new Trinity doctrine until his death. 1968 – Uppsala, Sweden – World Council of Churches admits to full membership the representatives from non-member churches, which include the Seventh-day Adventist Church. Published on July 12, New York Times newspaper. 1970 – Bert B. Beach is elected as the Secretary-General of the annual Conference of Secretaries of the Christian World Communions, which represents about two billion Christians and covers more churches than any other organization. He would hold this position until 2003. The principles and provisions of Adventism are altered in the books Seventh-day Adventists Answer, Question on Doctrine, and Movement of Destiny. The “divine Personalities”, the pioneer Adventist position on the human nature of Christ, is also changed and omitted in SDA publications. 1974 - Death of LeRoy Froom, one of the key men in apostasy. 1974 - The 1919 Bible Conference transcript is discovered by Don Yost and Don Mansell at the G.C Archives. 1979 – W. Duncan Eva and Bernard Seton are working behind the scenes in moving an agenda to adopt a new Statement of Fundamental Beliefs. The revision draft is sent to the “theologians” at Andrews University to ready it for prime time at the World Session in April 1980. Back in 1946 a committee had put forth an action making it almost impossible to change any Belief statement. But that hurdle was overcome and now moving forward. 1980 – World General Conference in session (Dallas, TX), officially votes to accept the Trinity doctrine, as part of 27 Fundamental Beliefs of Seventh-day Adventists. April 23, 1980 issue of the Adventist Review was published detailing the discussions surrounding the formulation of the new Fundamental Beliefs. “NEAL C. WILSON: For some time we have been considering a refinement of our Statement on Fundamental Beliefs. I think you have that document in your hands. No doubt you have done both some studying and some praying. We have heard a variety of interesting rumors. Some, it is said, understand that the church leaders want to destroy completely the foundations of the church and set the church on a course that would be un-Biblical, contrary to the tradition of the past and to historical Adventism. My fellow delegates, there is nothing that is further from the truth. We have also heard that any time we touch the Statement on Fundamental Beliefs we would be introducing the Omega, the final confusion of theological and doctrinal positions of the Seventh-day Adventist Church. I suggest to you that this is also a very unfortunate statement.” — Excerpt from Adventist Review, April 23, 1980 — Seventh Business Meeting, Fifty-third General Conference Session, April 21, 1980, 3:15 P.M.
By officially approving the Trinity doctrine as a fundamental belief of Seventh-day Adventists, the denomination has publicly declared to the world that she is following in the steps of the daughters (fallen churches) of the mother of harlots (the Roman Catholic church) whose central pillar doctrine is the Trinity. Therefore the SDA church has left the original mission (of proclaiming the three angels’ messages) of God’s calling and the firm foundation of our faith (Fundamental Principles) that are based upon unquestionable authority. No longer can the present SDA Church be considered as the “remnant of her seed, which keep the commandments of God and have the testimony of Jesus Christ”, but now simply a Counterfeit New Movement as prophesied in 1903 by Ellen White. 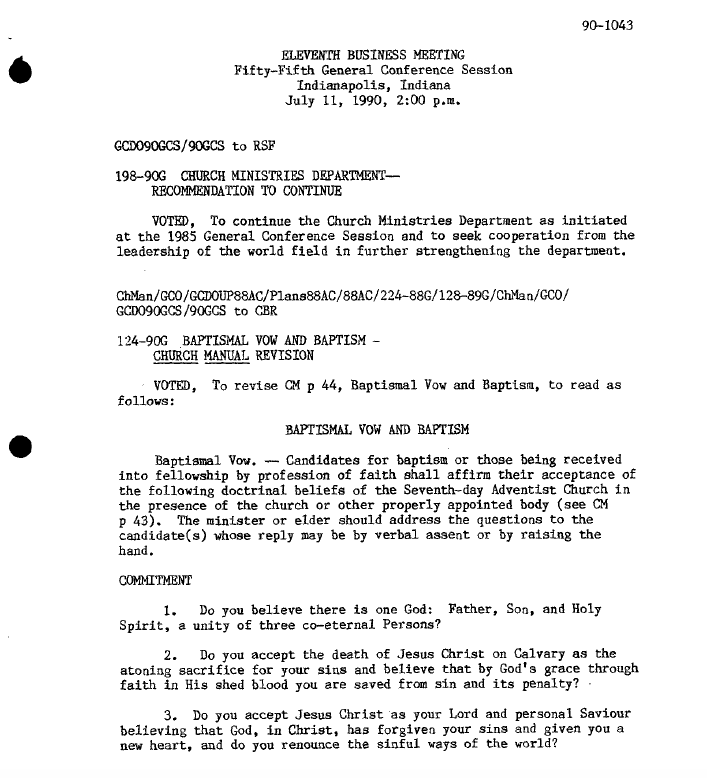 1984 - Baptismal vow is reformatted again – pro-Trinity. 1985 - A new SDA Hymnal takes the place of the older Church Hymnal of 1941. It is decided that there are even more songs that can be replaced or changed to fit the new 1980’s Fundamental Beliefs. Catholic terms are used in headings and responsive readings. 1988 - “Seventh-day Adventists Believe” 27 Fundamental Belief book is published (strongly Trinitarian). 1993 - George Knight, a professor and prominent SDA theologian, makes this startling confession in Ministry Magazine, October 1993: "Most of the founders of Seventh-day Adventism would not be able to join the church today if they had to subscribe to the denomination's fundamental beliefs. More specifically, most would not be able to agree to belief number 2 which deals with the doctrine of the Trinity." In all actuality, this would have included ALL of the founders and Pioneers of the early SDA Church and it should be alarming to today's members. 1994 – William Johnsson, editor of the Adventist Review, writes, "Adventist beliefs have changed over the years under the impact of present truth. Most startling is the teaching regarding Jesus Christ, our Savior and Lord." (Adventist Review, January 6, 1994) While the pre-existence of Christ is held, the divine begotten Sonship of Christ as held by the official world church up to the 1940's is denied as a "false doctrine" as Johnsson puts it. 1995 – G.C World Session in Utrecht, Netherlands. The Vatican flag is carried through the meeting hall in a singular fashion amidst an unusually loud ovation. 1996 – Merlin Burt writes, "During the 1930's there continued to be statements teaching the 'old view'... This largely changed during the 1940's. The fourth quarter of 1936 Sabbath School Lesson Quarterly was prepared by T.M. French. French concluded regarding Christ's pre-existence with these words: 'He was therefore no part of creation but was "begotten of the Father" in the days of eternity, and was very God Himself.' It seems that French was mixing Wilcox's fundamental beliefs reference to Christ as 'very God' with the 'old view' of a 'begotten' Christ." (Merlin D. Burt, Demise of Semi-Arianism and anti-trinitarianism in Adventist theology, 1888-1957, p. 40) So the belief in a begotten Christ has become the "old view", while an unbegotten Christ is now the new officially accepted doctrine. 1997 – SDA logo is changed from the three angels to flames and cross, becoming Catholic friendly. 1999 - B.T. Rice, pastor of the St. Louis SDA Northside Church addresses the Pope in a Vatican mass held locally as "Pope, your Holiness, your historic visit to St. Louis..."
2003 – John R. Graz (GC director of Public Affairs and Religious Liberty since 1995) is elected as Secretary-General of the annual Conference of Secretaries of the Christian World Communions, succeeding Bert B. Beach. Graz would hold this position until 2014. 2003 – Questions on Doctrine is republished and circulated by Andrews University-- pro-Trinitarian, pro-unfallen human nature of Christ. 2012 – The White Estate database is hacked by an anonymous party known as “SDAnonymous.” Their concern is for public access to all of Ellen White's documents and that they have been restricted and it is public domain at this point as they should belong to the people. The meaning and context of her writings is hampered by not being able to view everything in its entirety. The hacker is pushing for full digitized access to anyone wanting them, not just a handful of privileged people. The White Estate attempts to sue for damages. The hacker threatens to release all of Sister White's writings. Their request is that the White Estate does it to save their reputation. 2014 – Ganoune Diop (GC director of Public Affairs and Religious Liberty since 2011) is elected as the new Secretary-General at the annual conference of secretaries of the Christian World Communions. 2015 – Ellen White Symposium is held at Andrews University and spread worldwide, denies the Spirit of Prophecy's inspired authority to define doctrinal faith and practice, but only as theological and practical guidance and end time application. 2015 - The White Estate reaches a court settlement with the “SDAnonymous,” and releases the rest of Sister White's unpublished writings that they have been holding back for years. The SDAnonymous hacked into EGW estate’s database and was able to obtain files containing manuscripts that were not released to the public. The collection contains approx. 8,300 typed documents, letters and manuscripts dating from 1845 to 1915. Honest Adventists now fully know that Sister White wrote over and over that Jesus is their Comforter coming to them in spirit form as the Holy Spirit, not some other mystery person or Ghost. The dogma of the denomination's teaching has been shown to be in error for those who want to know and are paying attention. Click HERE for SDAnonymous’ press release. Download the PDF version with updated information HERE.